"Chuck Versus the Bearded Bandit"
Pretty good ep. I really liked Carrie Anne Moss as Verbanski and I think that's setting up a happy ending for Casey? 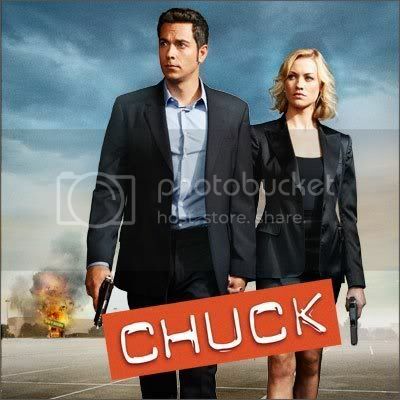 I don't care if it's the intersect messing with his head (hello, how many problems did Chuck have? Have they not thought about the watch? ), Morgan is still annoying. Not liking the changes in Morgan. I'm sure they'll be resolved by the end of next ep, if not the following one! What did you think of the rest of the episode? Episode Thoughts: I was very concerned about mid-way through that Morgan was adapting to the Intersect way too well - this was until he didn't get the Indiana Jones joke. As annoying as Morgan may be to some people, I think some people are missing how much Chuck has grown and how successful he is as a spy WITHOUT an intersect. I also find it hard to believe Morgan will have the intersect much longer - it's clearly killing him - in a different way than it was killing Chuck. Let's not forget that Chuck had his dad's watch to help him before with the newer intersect. PS: Love the competing companies storyline - I was glad to see that Casey's daughter/Morgan's gf was mentioned in this episode. I was getting slightly concerned they were just dropping her. So when does everyone think (if they think it) Morgan will somehow lose the intersect? DharmaLager wrote: So when does everyone think (if they think it) Morgan will somehow lose the intersect? I hope very soon, because I will not watch an episode with Morgan as the intersect. Based on the progress with Morgan already, I can only assume they have to get it out of Morgan ASAP (or else I can only imagine he'll be lost forever - kind of like a certain villain from last year - only in a different way).